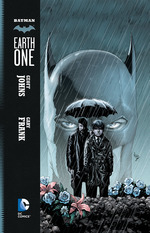 The Story: Batman: Earth One, written by Geoff Johns, is exactly what you expect. It retells Batman’s origin story in a way to keep it familiar while changing up things just enough to seem a little different. 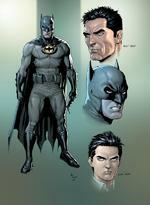 It is not in anyway a bad comic, but better stories have been told of this period of Batman’s career. The Art: The art work provided by Gary Frank, Jonathan Sibal and Brad Anderson is perhaps a bit too bright and pretty for the city and characters being “introduced.” If anything, it seems a bit Hollywood in the way they only want to tell stories about pretty people doing bad things to each other in well lit places. Even comparing it to the recent Batman movie origin Batman Begins, this book’s appearance is brighter and more colorful than the film. For me, this is a drawback, but that certainly may not be the case for everyone. The Writing: A few Green Lantern and Wally West stories aside, I am not the biggest Geoff Johns fan. It’s not that I think he is a bad writer, just that it seems to me that he kind of wants to rewrite comics from when he was a kid. If that is the case then good for him for getting to do what he wants, but I liked those stories better the first time I read them. I know that seems pretty harsh, but please consider: brought back the JSA, brought back Hal Jordan, Teen Titans relaunch, brought back Barry Allen, Superman origin retold, rebooted Justice League, and now Batman: Earth One. That is a lot of going backwards for stories. To be fair this is an industry problem and not just something Johns is doing, however it is still something he is doing and again to be fair he’s incredibly successful at it. 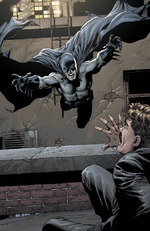 The Rant: My overall problem with Batman: Earth One is basically that last paragraph. Why do we need another Batman origin story? It doesn’t fit the newly rebooted 52 or the Nolan-verse and DC doesn’t seem to want to have an Elseworlds type line anymore, so where does this fit? To me, the only way it fits is in this constant circle chase superhero comics finds itself in of constantly living in the past. DC and Marvel are so afraid to move forward and do anything different that fans are constantly given reboots or in this case re-imaginings of things they’ve already read instead of anything fresh. Obviously, I know anything Batman sells (I bought it didn’t I? ), but who’s to say I wouldn’t have bought this book as an origin for a new character as well? Can you even imagine DC giving a new character this type of launch? The Verdict: If you are a fan of the creative team, wanted the Penguin to win the race for mayor in Batman Returns, are a mark for all things Batman (but not as bitter as I am), or perhaps have a gift certificate or store credit burning a hole in your pocket then this is the book for you. If not, I’d like to suggest recent Batman trades like The Black Mirror, The Court of Owls, or Batman & Robin: Born To Kill instead.